This recipe for a 7-layer casserole is made in layers. 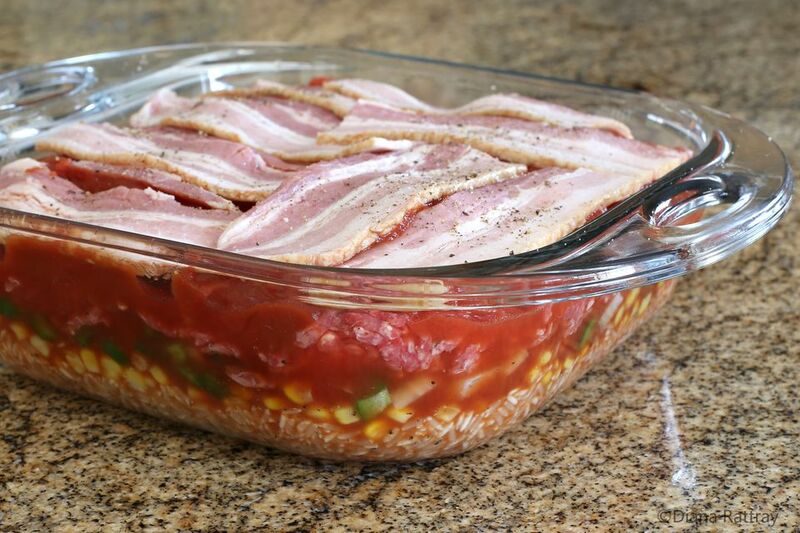 The savory layers include ground beef, rice, corn, tomato sauce, and other vegetables. It's a complete meal in one dish and is wonderful served with crusty rolls or cornbread and a tossed green salad. The original recipe, from a 1950s Hunt's Tomato Sauce ad, was made with another can of tomato sauce in place of the diced tomatoes. We added an optional eighth layer of shredded cheese. Put the rice in a 2-quart baking dish. Spoon the corn evenly over the rice layer and sprinkle lightly with salt and freshly ground black pepper. Combine the 1 can of tomato sauce with 1/2 cup of water and pour over the corn layer. Sprinkle with the chopped onion and bell pepper. Top the onion and pepper layer with the ground beef and sprinkle lightly with salt and freshly ground black pepper. Top with the strips of bacon. Cover tightly with foil and bake at 350 F for 1 hour. Uncover and cook 30 minutes longer, until bacon is crisp. If desired, top with shredded cheese, return to the oven and continue baking just until the cheese has melted.